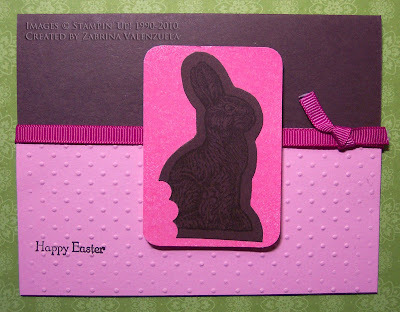 Zabrina made this cute card with the chocolate bunny in the Occasions mini catalog. She used the scallop circle punch to make it look like someone had already taken a bite. Of course, I usually start with the ears myself! The pretty in pink cardstock has been embossed with the Perfect Polka Dots Textured Impressions folder. I love this bunny stamp and the use of the scallop circle punch to make it look like it's a bite.